New poll shows more religious parents happy with their child's school than secular parents, quarter of Israeli parents dissatisfied. A new survey showed religious parents are more satisfied with their children's schools than secular parents, and college-educated parents are less satisfied than high school-educated parents. The survey was conducted by the Rafi Summit research institute, for the Gool Bagrut online matriculation site. According to the survey, 83% of parents under the age of 35 are satisfied with their children's education, compared to 71% of parents over the age of 46. 73% of college-educated parents satisfied with their child's school, while 76% of parents without a college education were satisfied. 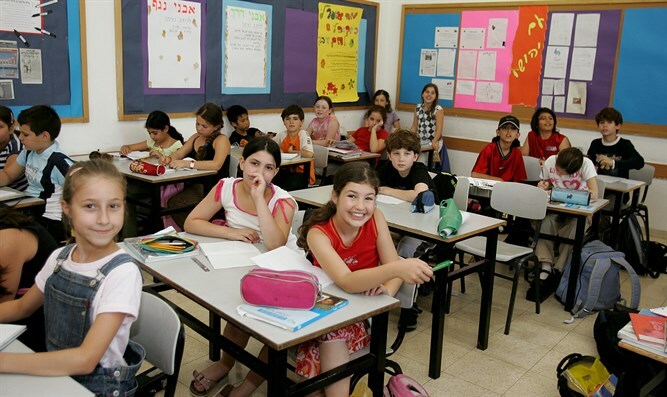 Approximately a quarter of Israeli parents are not at all satisfied by the level of education at their child's school. Gool also showed that parents living in Jerusalem were more satisfied with their children's schools than parents living elsewhere in the country. Tel Aviv's parents are the second-most satisfied, and those living in the Sharon region came in third, with 77%. While 74% of Haifa-area and northern parents are satisfied with their child's school, only 65% of those living in southern area said the same. According to Gool pedagogical expert Yochai Twig, the fact that a quarter of Israeli parents are not satisfied with their children's education means there needs to be a significant strategic change. However, he added, it's clear that the Education Ministry is working to improve the situation, and there may well be a change in the future. Twig also noted that the Education Ministry is working to integrate technology into the classroom. "More and more parents are turning to us and subscribing to our site, in order to provide video tutoring for their children," Twig said. "We believe that it's not just because it's financially viable, but also because they want to help the teachers understand what their child needs to be taught."